I wanted to share a fun little zipper bag pattern with you today. I was inspired by a similar zipper bag I saw on Pinterest (of course). Have you seen this Pin? I saw this and wanted to make one, but it is only a tutorial in pictures. Find the original post here. So here is my version - pattern and tutorial! 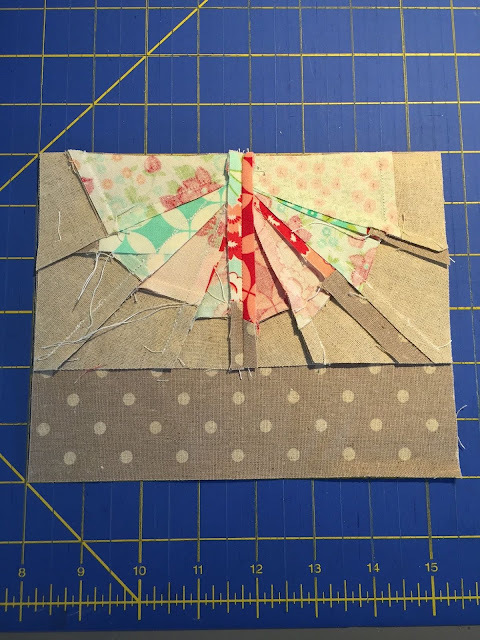 Note: this tutorial assumes knowledge of Foundation Paper Piecing (FPP). If you would like more information about FPP, please search YouTube for tutorials and then come back here to create. Cut linen into 8 - 2.75" x 3.5" strips. 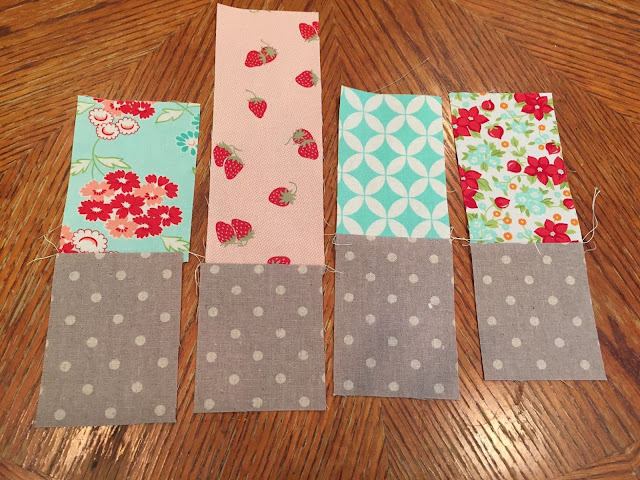 Cut floral fabric into 8 - 2.75" x 4.5" strips. Take your first strip set and lay it face down on top of your second strip set face up. You will need to line up the fabrics in two ways: First, the edge of the fabric should match the 1/4" seam allowance mark on your template. 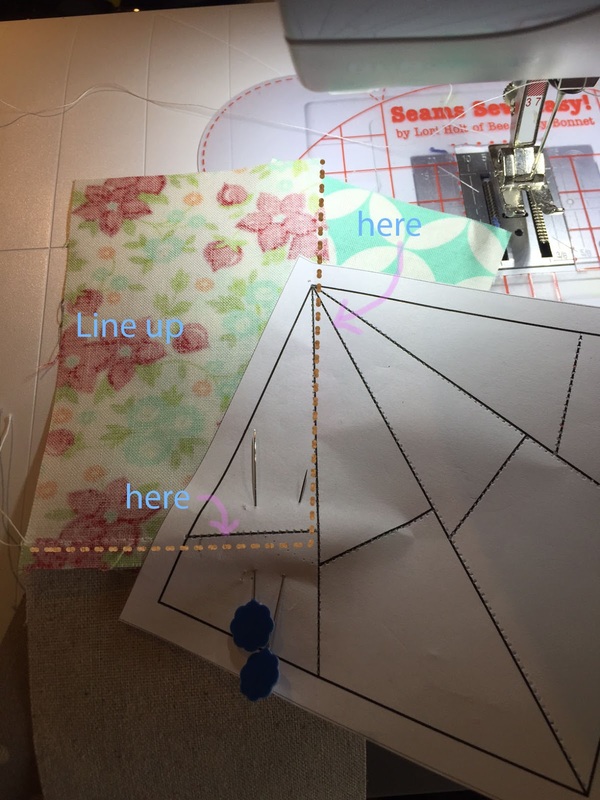 Second, the middle line of the first section of the template needs to line up with the seam allowance on your fabrics. See the line that the pins go under? 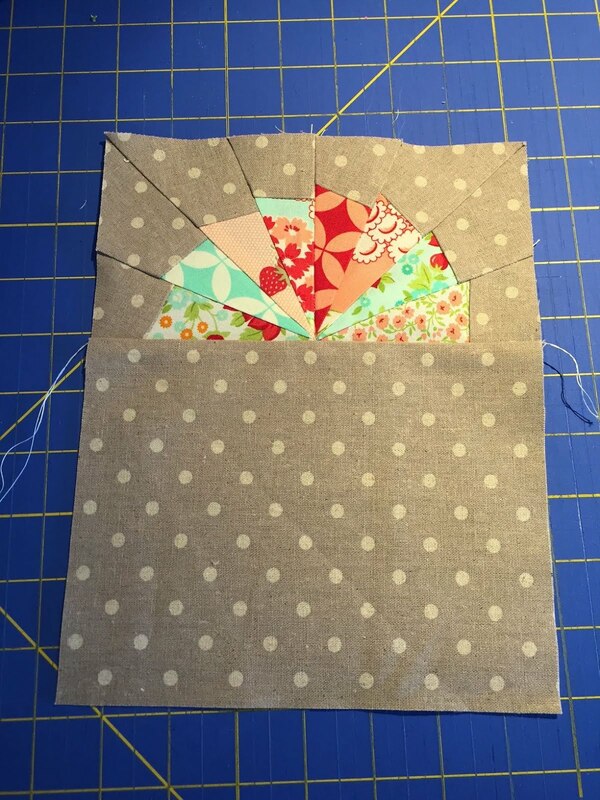 Since the template's middle lines are on an angle, your face-up fabric will now be on a bit of a diagonal. Make sure that you have plenty of fabric within the lines of the second section of your template. 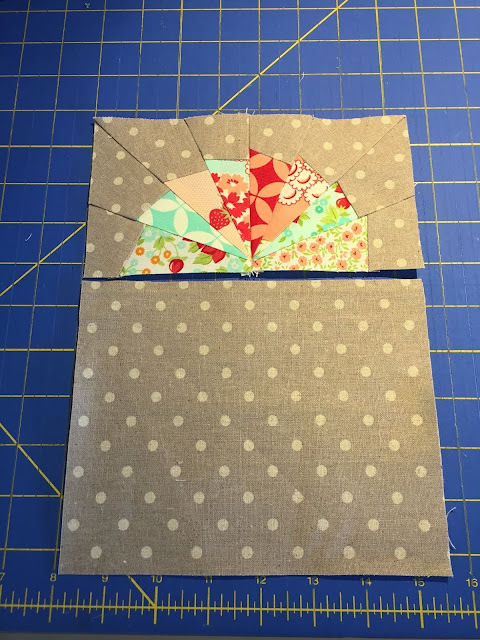 Trim the fabric to 1/4" seam allowance, pin, fold your template back over to the front and sew. Remove the paper and voila! My finished piece came to 7.5" wide x 4" high. Now to make the zipper pouch! First, I should say that there are LOTS of ways to make a zipper pouch. Feel free to use your own favorite method. Here is what I did: sew this piece to a 7.5" x 6" rectangle. Now, cut batting and a lining fabric to match the size. I made little tabs to cover the ends of the zipper: these were rectangles of about 1.5" x 3". 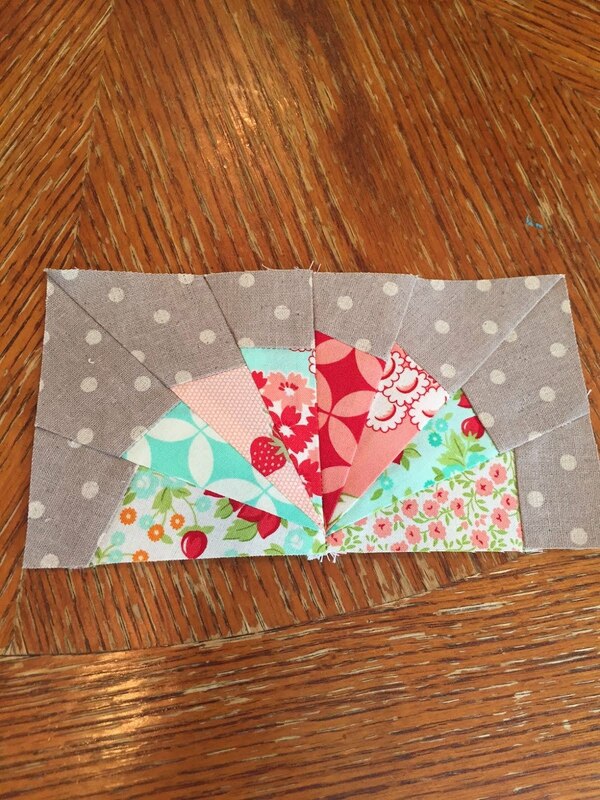 Fold in half and place on the ends of the zipper, about 1" in from the edges of the fabric. Using a zipper foot, sew along the top edge of the bag. Now unzip the zipper. To attach the zipper to the other side of the fabric, I folded the front of the bag and the batting to the other side of the zipper, and the lining up to the other. Sew again using a zipper foot. To box out the corners, I folded the sides down and stitched 1.25" across the bottom of the bag. Turn inside out and your bag is ready! I got the cute little strawberry pattern here. Enjoy and do let me know if you have any questions! 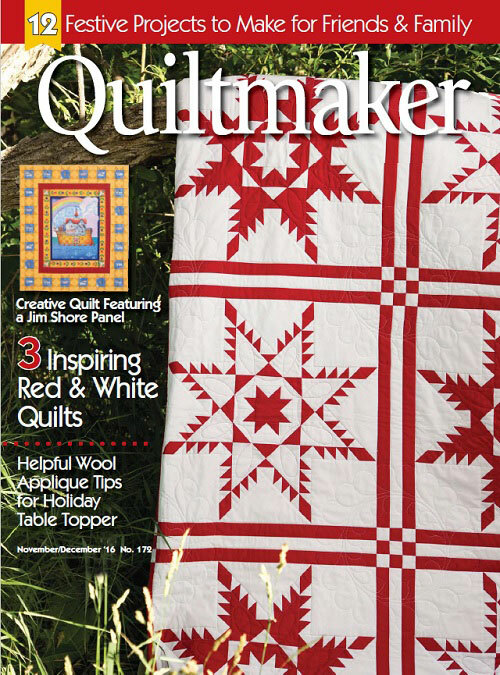 Jenny, crafter, quilter, mom of 10 year old big sister and 7 year old little brother. Former retail buyer, lover of fabric, interiors, paper, knitting. Oddly drawn to baskets and anything in miniature. When I get some downtime, I grab a cup of tea & hope to share my crafting adventures!